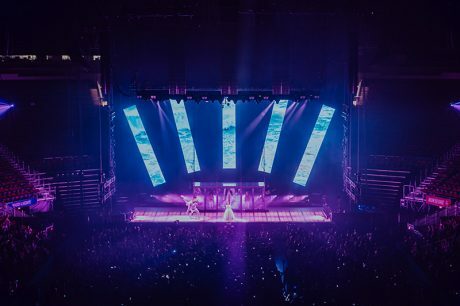 After kicking off last September at the U.K.’s O2 Apollo Manchester, Melodrama — the world tour by New Zealand-based pop sensation Lorde in support of her June 2017 album release — continues on a string of packed theaters and arenas. And after completing successful tour legs in Europe and Oceania, the Lorde entourage is now steaming across North America. 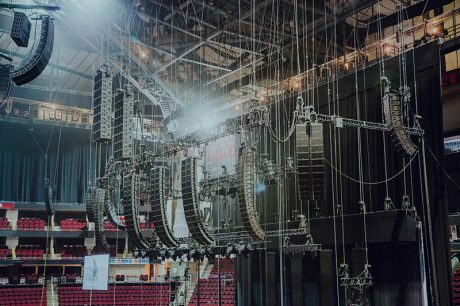 The artist last came through in 2016, but what’s different this time is that the tour is carrying an L-Acoustics L-ISA audio rig — an immersive audio system that can transform a large venue into an intimate listening experience, but beyond that, offers the creative FOH engineer a wide palette in which to explore intuitive placement and movement of input channels in 3D. Pronounced “el-eeza,” the L-ISA (Immersive Sound Art) system takes audio inputs (typically direct outs) from a conventional mix console and routes them to a hardware L-ISA Processor that, under L-ISA Controller Mac/Win software control, provides a single-screen visualization of all sound objects in the 3D mixing space, with easy access to spatial parameters, such as pan, width, distance and elevation for each sound object. The playback side uses five arrays over the stage (with or without subwoofers), and optional “extension” speakers, which can widen the coverage to the side walls. This comprises a “frontal” system, although further options can also include overhead or surround speakers. Capable of operating in real-time, L-Acoustics’ Soundvision acoustical and mechanical simulation program calculates SPL coverage, SPL mapping and delay coverage for complex sound system/venue stereo or multichannel configurations. 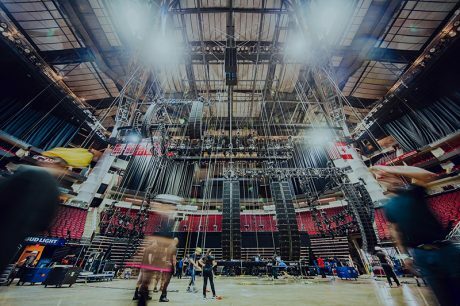 The beginnings to a creative and technical partnership began last year, between Lorde’s production team, sound company Firehouse Productions and L-Acoustics, when the speaker manufacturer was looking for a project to showcase the power of L-ISA. 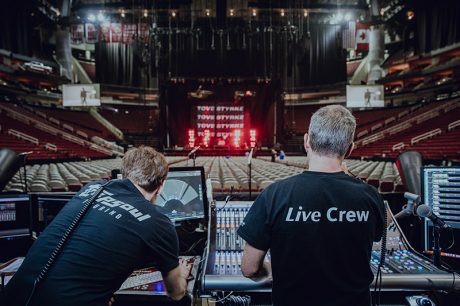 “Our production manager, Richard Young, went to L-Acoustics’ L-ISA Lab in London and met with L-Acoustics founder Christian Heil and L-ISA Lab director Sherif El Barbari, who pitched it to him,” recalls longtime Lorde FOH engineer Philip J. Harvey. On this tour, the frontal system has nine speakers — a center K2 hang, inner K2 hangs on both sides of that, flanked by Kara hangs (where, normally, the left/right systems hangs would be) and extension hangs of Kara on either side of that, along with mono rear and front, above the subject K2. With nine arrays and two subwoofer hangs, there was a lot of rigging going on. Systems engineer Michael Gazdziak (left) and FOH engineer Phillip J. Harvey tweak some input placements on the L-ISA Processor screen. We asked Harvey about his overall impressions of the L-ISA technology. 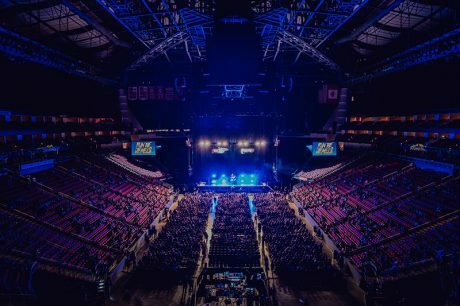 Following loud, aggressive opening sets from Mitski and Run The Jewels, Chicago’s Allstate Arena went dark at 8:45pm on March 27, as Lorde’s performance opened with an ominous, thunderously massive synth swell that set the precedent for what was the widest sounding concert image I’ve ever heard. Being in an older venue better known for its hockey games, I was anxious to hear how L-Acoustics’ new L-ISA technology would perform in this less-than-pristine, circa 1980 acoustical box. The artist remained front-and-center on an austere stage nearly the entire time — both physically and vocally, yet the sonic elements of her show were considerably more expansive in their breadth. “Hard Feelings” from Lorde’s latest album, Melodrama, was a good example. Although her vocals lined up with her presence on stage during the verses, the imaging of various vocal parts in the chorus was spread incredibly wide. And industrial-sounding bits of electronica danced back and forth in the mix on a much broader scale than a traditional mono/stereo P.A. could possibly replicate. Thanks to this stretched canvas, each of the show’s inputs was able to retain its own sonic identity, free of the mush that comes from too many sources crowding the same space. And Lorde’s voice remained exceptionally clear and intelligible throughout the entire performance, from breathy whispers to howling falsettos. 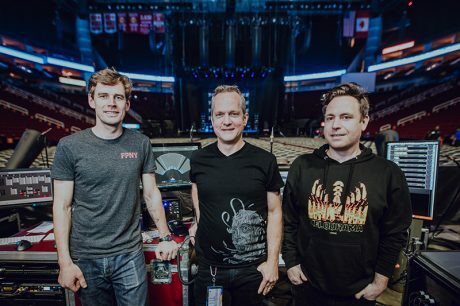 I was told by the production team that the sonic “wow” factor of what can be done with L-Acoustics’ L-ISA technology was intentionally understated on this North American tour leg. Very few things were being done in the extreme, because that wasn’t the creative vision for this show. That said, the soundscape was panoramic and natural — much like our ears expect to hear things in real-life around us. 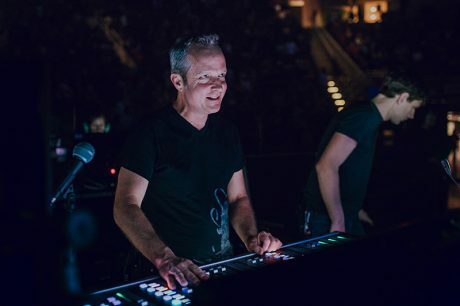 I imagine that, in mid-show, if the audio reinforcement was snapped back into the standard L/R arrangement used by the opening acts, the entire audience would have immediately noticed how flat and lifeless the mix would have suddenly become.